Today is National Homemade Soup Day, so naturally I had to make soup. 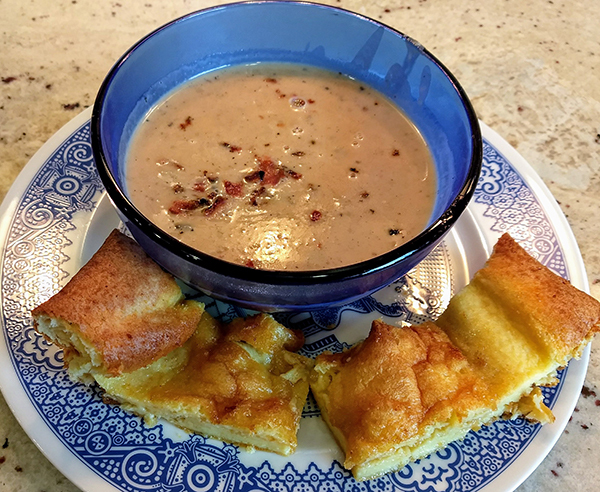 While pondering what soup to make, I rummaged through my recipe cards and stumbled across a recipe for White Bean and Bacon soup. It was in my handwriting, so clearly I had made this before and we liked it enough to decide to keep it, but neither Richard or I could remember a thing about it. It’s a pretty simple soup. You cook up a couple strips of bacon, then set those aside and cook onion and garlic on low heat until they’re nearly translucent, and then you toss in some stock and some beans and some basil and red pepper flakes and simmer that for 20 minutes or so, and after all that, then you blend it all together and finish it off with a dash of cream and the crumbled bacon. 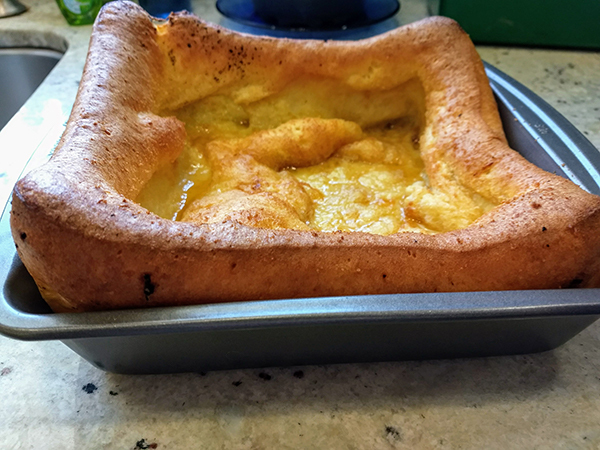 That would have been perfectly fine on its own, but then I discovered that it’s also Yorkshire Pudding Day. As far as I’m aware, I’ve never tasted this, and conveniently my 40+ year old Betty Crocker cookbook has a recipe, so I figured I’d give it a try. The recipe starts off by mixing flour, eggs, and milk into a bowl. But then it gets weird. This recipe assumes you are making alongside a beef roast, so you collect a half cup of drippings. And if there isn’t a half cup available while you’re cooking your roast, you are to melt shortening and add it until you reach the full amount. So….one half cup of melted fat. Okay. I figured, hey, the soup has bacon, and I do have a jar of bacon fat in the refrigerator, so I could just use that, so it’d go with the soup. Next you pour the drippings / melted shortening / bacon grease – into a pan and you pour your flour and milk mixture on top of that, like so. 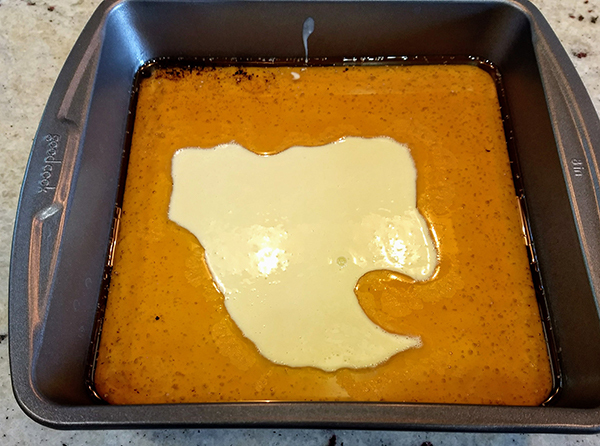 At first glance, it looks as if this is some kind of weirdly shaped pancake floating in a sea of maple syrup, doesn’t it? But no. That’s all melted bacon grease. Finally, you throw the pan in the oven and bake it for about half an hour, which was conveniently the time required to simmer the soup. The pudding puffed alarmingly high on the sides, but the middle, even though it was cooked, did not. I suspect because there is only so much dough can do to counteract the presence of an entire HALF CUP of grease in the pan. Verdict: The soup was delicious (yay to past me for saving this recipe! ), but the pudding was….not. The sides that had puffed above the grease line were a bland bread sort of thing, but the middle part was pretty much what you might expect for a piece of baked dough that’s been soaking in grease for half an hour. It was *dripping*, people. Shudder. I freely admit that, because I’ve never made this, and also because puddings of this type are not a typical American dish, that it is highly likely did something wrong with the recipe, or maybe bacon fat just isn’t the best thing to use, but….yeah, no. Not motivated to try this one again. Ever.